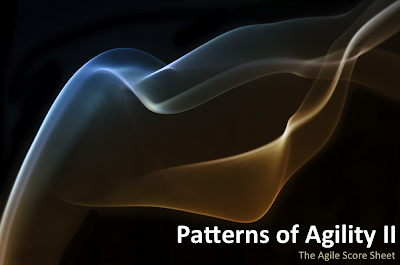 Some time ago I wrote a post here about Patterns we can identify in projects and how they relate to the life-cycle model in use for the project. Some patterns are definitely signs of an Agile project (release working software at the end of every *very* short iteration for example). Other patterns are clear signs that we are in the presence of a waterfall project (writing never ending power point presentations to prepare a project approval and then rushing with the actual coding). There was quite a lot of good feedback on that post and @lebedev_dmitry even suggested that I present a talk at Agile Riga Day on the same subject. So I prepared a presentation to explore this theme. You can check out the presentation in my slideshare page. But I felt that a presentation was not enough. Yes, we need to introduce the idea of patterns and how to recognize the context in your project, but we also need to reflect on the actual patterns we see in our projects. So I decided to end the presentation with a short reflection/retrospective exercise: the Agility Score Sheet. Try it out. Read the presentation, then take the sheet and score your project. What did you find? What thoughts came to your mind after completing the exercise? What will you change tomorrow? Feel free to edit the Agile Score Sheet. I've opened it so that anyone with this link can read it and edit it directly. If you attended Agile Riga Day 2011, you can rate my talk here.